Party leader John Leahy said it is important people know what the party stands for. Renua party leader, John Leahy, alongside Mailo Power, Eddie Hobbs Ronan McMahon and Jonathan Irwin, CEO of the Jack and Jill Foundation at the launch of their party in 2015. 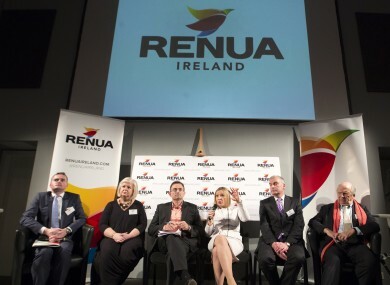 RENUA HAS RELAUNCHED the party’s core principles and dropped its policy of allowing elected party members a free vote on the issue of abortion. The policy document, made up of six pillars, firmly sets out that party candidates who want to run in the next general election and any TDs elected to the next Dáil must firmly adhere to the party’s policy on abortion. Under their “pro-life” pillar, it states that the party strongly supports the 8th Amendment. It states that Renua “believes that the Eighth Amendment is a secular human rights issue as it protects the human rights of the unborn child”. The party states that it “understands” that some party members declare “freedom of conscience” on this issue. It accepts this stance for members, adding that they will not be required to support, canvass, or issue statements in support of the party position. However, party candidates and elected representatives will be required to “subscribe fully to the party position on the matter”. This is quite the departure from the party’s early days under Lucinda Creighton’s leadership. During the party’s launch in Dublin back in March 2015, Creighton repeatedly emphasised the party’s “open position” on matters of conscience, outlining that the party would allow a free vote on such issues. Renua leader, John Leahy told TheJournal.ie that under his leadership it is important people know what the party stands for. “It was time for us to get off the fence on the issue,” he said, adding that other parties needed to make their position on the issue known. “The Citizen’s Assembly is coming down the line, it is an important issue, and political parties should let people know where they stand,” he said. We are sticking to it, it would have been easier for Renua to scrap everything and start again and be populist, but that’s not for us. According to the new policy document, Fianna Fáil is “populist” and Fine Gael is “socially liberal”. However, Leahy said Renua’s clear-cut viewpoint on the abortion makes them different from other political parties. Leahy said he didn’t feel the new position would deter possible candidates from signing up to the party, stating that the party’s viewpoint on the issue is now clear for all to see and people can either support them or not. “It’s my hope that people will start seeing through the populist politics of the moment,” he said. One of the more controversial policies Renua championed in the run up to the general election, the controversial ‘flat tax’ of 23% on all income has been firmly placed on the scrap heap. The internal review of the party’s policies, which took longer than expected according to Leahy, also contains Renua’s “modified” core tax policy. The costed tax policy, which was formulated with the help of economist Jim Power, focuses on the marginal tax rate of €33,800. Leahy said Renua is all about “putting the taxpayer first”. He said taxation of over 50% at this rate was an issue for his party, which is why they are arguing it should be pushed out to €44,800. “We believe a lot of people are not taking up active employment because of this,” said Leahy. “Some people are finding it more beneficial to be on welfare,” he added, pointing out that feedback from their review found that workers were questioning if they should go back to work due to the high tax bracket. The other party pillars deal with include entrepreneurship, getting tough of repeat offenders, local democracy and creating a cohesive society. The last election was absolutely disastrous for Renua, with the party failing to win a single seat in the 32nd Dáil, with the leader losing her own mandate in Dublin Bay South along the way. Is the party ready for an election? “We are prepared,” said Leahy, who vowed to have candidates running around the country. He said there is a big interest in the party, with future candidates already being selected, said the new party leader. “It is very easy for Renua now as we are very clear now on what we stand for,” said Leahy, who speculated that a general election wouldn’t be called any time soon. “My view is that Fianna Fáil are waiting in the long grass. They don’t want to deal with the issues that are there at the moment. They will drag it out for while,” he concluded. Email “'It's time political parties get off the fence on abortion': Renua is now a pro-life party”. Feedback on “'It's time political parties get off the fence on abortion': Renua is now a pro-life party”.